Size of this preview: 800 × 530 pixels. Other resolutions: 320 × 212 pixels | 3,000 × 1,987 pixels. 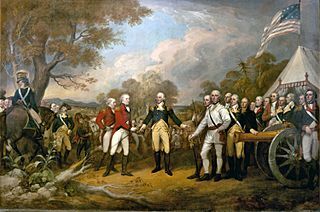 Description: The scene of the surrender of the British General John Burgoyne at Saratoga, on October 17, 1777, was a turning point in the American Revolutionary War that prevented the British from dividing New England from the rest of the colonies. The central figure is the American General Horatio Gates, who refused to take the sword offered by General Burgoyne, and, treating him as a gentleman, invites him into his tent. All of the figures in the scene are portraits of specific officers. Trumbull planned this outdoor scene to contrast with the Declaration of Independence beside it. John Trumbull (1756–1843) was born in Connecticut, the son of the governor. After graduating from Harvard University, he served in the Continental Army under General Washington. He studied painting with Benjamin West in London and focused on history painting. Major figures in the painting (from left to right, beginning with mounted officer): American Captain Seymour of Connecticut (mounted) American Colonel Scammel of New Hampshire (in blue) British Major General William Phillips (British Army officer) (in red) British Lieutenant General John Burgoyne (in red) American Major General Horatio Gates (in blue) American Colonel Daniel Morgan (in white) A full key is available here. The dimensions of this oil painting on canvas are 365.76 cm by 548.64 cm (144.00 in by 216.00 in). This page was last modified on 21 April 2017, at 00:27.